Additional dilution buffer can be purchased separately. Accurate quantitation of next-generation sequencing (NGS) libraries is essential for maximizing data output and quality from each sequencing run. 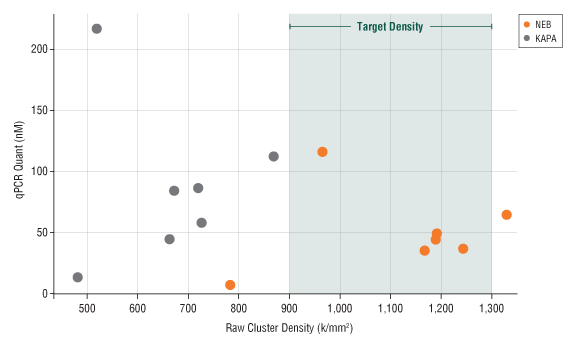 For Illumina® sequencing specifically, accurate quantitation of libraries is critical to achieve optimal cluster densities, a requirement for optimal sequence output. qPCR is considered to be the most accurate and effective method of library quantitation, providing considerably higher consistency and reproducibility of quantitation. Further, amplification-based methods quantitate only those molecules that contain both adaptor sequences, thereby providing a more accurate estimate of the concentration of the library molecules that can be sequenced. The NEBNext® Library Quant Kit has been optimized to provide substantial performance and workflow improvements to qPCR-based library quantitation. Be confident in your quant values, with more accurate and reproducible results than other methods and kits. Quantitate more libraries per kit, as only 4 standards are required. Simplify your reaction setup with fewer pipetting steps and a single extension time for all libraries. Use with all your libraries, regardless of insert size, GC content and preparation method. 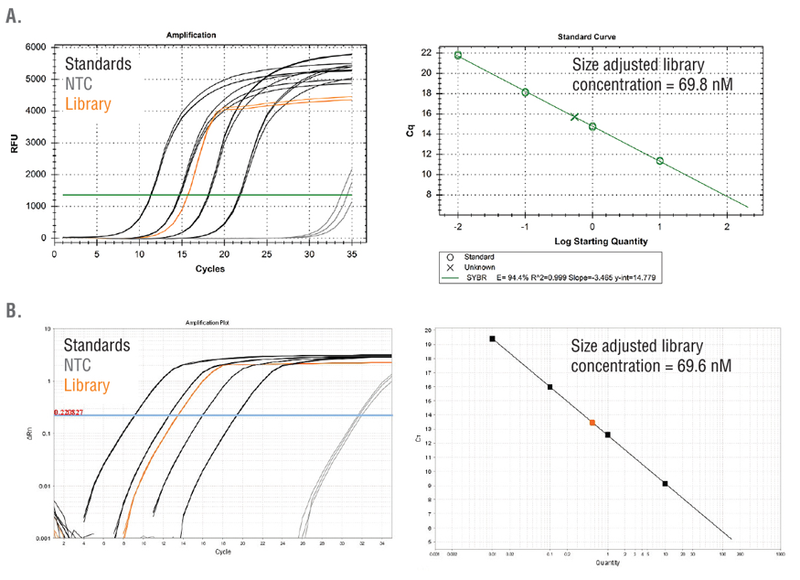 Typical results from the NEBNext Library Quant Kit on a Bio-Rad CFX96 Touch (A) and an Applied Biosystems 7500 Fast real-time qPCR instrument (B). Amplification curves are shown on the left and resulting standard curves on the right. All default settings were used on both platforms. ABI 7500 Fast assay included 1X ROX (Low Concentration) and the ROX normalization. 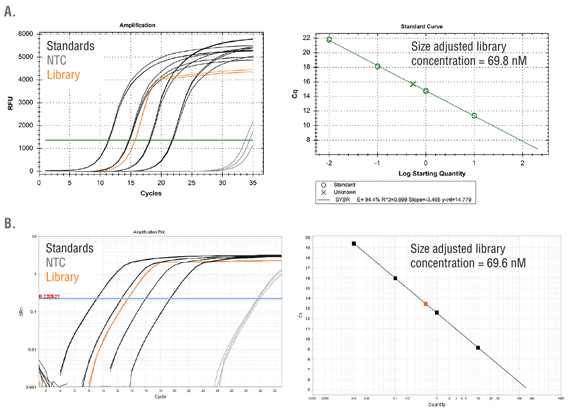 The NEBNext Library Quant Kit components have been optimized to deliver significant improvements to qPCR-based library quantitation for Illumina sequencing. The kit contains primers which target the P5 and P7 Illumina adaptor sequences, and a set of four high-quality, pre-diluted DNA standards to enable reliable quantitation of diluted DNA libraries between 150–1000 bp. Each set of reagents is functionally validated together through qPCR-based library quantitation assays. Reagents pass the functional test by adhering to stringent criteria set for assay efficiency and quantitation cycles (Cq) for each DNA standard and no template control reaction. 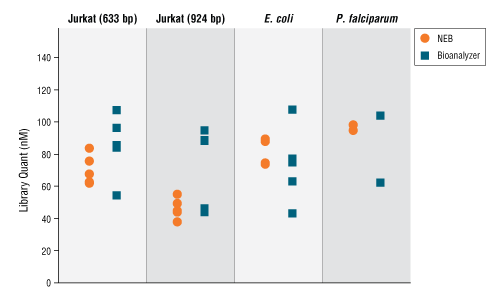 Concentrations of 4 libraries were determined by the NEBNext Library Quant Kit (orange) and compared to values measured using the Aglient Bioanalyzer (blue). Compared to NEBNext’s qPCR-based method, the Bioanalyzer concentrations displayed a greater level of variation. 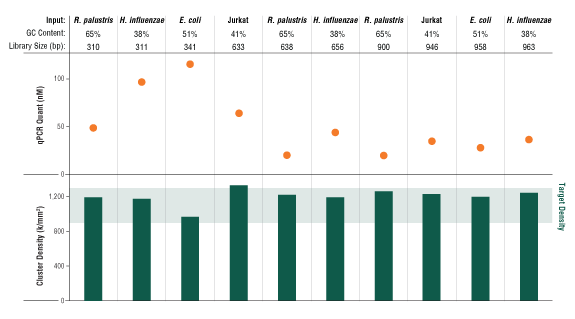 Three 340–400 bp libraries were quantitated by 4 different users 2–4 times using either the NEBNext or KapaTM Library Quantification Kit (Universal). 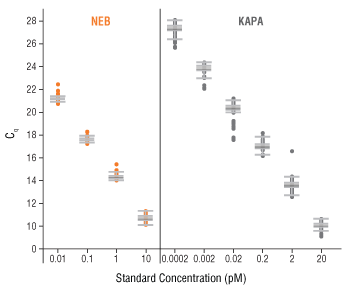 A notable improvement in quantitation consistency was observed for concentrations determined by the NEBNext Kit (orange) versus those from the Kapa kit (gray). Accurate qPCR quantitation requires the use of high-quality DNA standards with known concentrations. The NEBNext Library Quant Kit contains 4 standards produced with a high level of both quantitation accuracy and consistency. This figure shows data from >70 total runs from 4 lots of both NEBNext (orange) and Kapa (gray) standards, with all Cq values plotted. Box and whiskers indicate mean and quartiles. The NEBNext Library Standards displayed much lower variation in Cq, resulting in more consistent quantitation performance. Seven different libraries were quantitated using either the NEBNext Library Quant Kit (orange) or the Kapa Library Quantification Kit (Universal) (gray). Undiluted library concentrations ranged from 2–200 nM. Libraries were diluted to 8 pM and loaded onto a MiSeq® instrument (v2 chemistry; MCS v2.4.1.3). Libraries quantitated with the NEBNext kit resulted in a raw cluster density average of 1160 k/mm2, directly in the optimal range of 900–1300 k/mm2. In contrast, libraries loaded based on the Kapa quantitation averaged only 660 k/mm2. Libraries of 310–963 bp from the indicated sources were quantitated using the NEBNext Library Quant Kit, then diluted to 8 pM and loaded onto a MiSeq (v2 chemistry; MCS v2.4.1.3). Library concentrations ranged from 7–120 nM, and resulting raw cluster density for all libraries was 965–1300 k/mm2 (ave. =1199). Optimal cluster density was achieved using concentrations determined by the NEBNext Library Quant Kit for all library sizes. A selection of libraries successfully quantitated with the NEBNext Library Quant Kit. Libraries are plotted by size, ranging from smaller libraries (sRNA, FFPE) at 150–230 bp to largest libraries at 980 bp. Various input sources were used, ranging from 20-70% GC content, as indicated by text color. Libraries were prepared using NEBNext, Illumina TruSeq® Nano and Kapa Hyper library prep kits (data not shown). No dependence on size or GC content was observed in library quantitation when using NEBNext. All of the individual components of the NEBNext Library Quant Kit for Illumina are stable at –20°C for two years. When not in use, kit components should be stored at –20°C. All components of the kit, including the combined NEBNext Library Quant Master Mix and Primer Mix, are stable for at least 30 freeze/thaws. Once the Primer Mix has been added to the NEBNext Library Quant Master Mix (see Protocol on page 6 of manual), the resulting mix can be stored at –20°C for seven months. For short-term storage, this mix may be stored at 4°C for up to six weeks. Reactions can be prepared at room temperature, but unused portions of the kit reagents should be kept on ice after thawing them for use. If you need dilution buffer in addition to what is provided in the kit, it can be purchased separately. How much should I dilute my library to run in the Quant Kit? Can I run the NEBNext Library Quant Kit on my qPCR machine? Which ROX should I use for my qPCR machine? 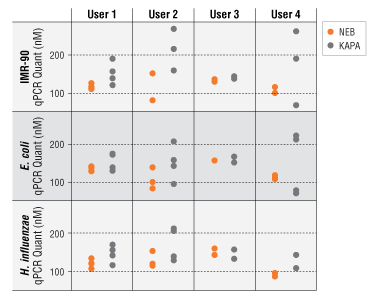 Are 4 standards enough for a qPCR quantitation? Does the library quant require a size correction? What other materials/information do I need to run the kit? How many libraries can I quantitate at a time? How long is a run of the Quant Kit? Do you provide any analysis tools to help with the quantitation? Can I see adaptor dimers as a measure of library quality? How long can I store the master mix after adding the primers? Can the NEBNext Library Dilution Buffer be purchased separately?